Created by Stan 'The Man' Lee and Jack 'King' Kirby. The Kree is an extraterrestrial humanoid race who have created a vast empire in the Greater Magellanic Cloud. The Kree race began on the planet Hala in the Pama system long before the first mammals appeared on Earth. 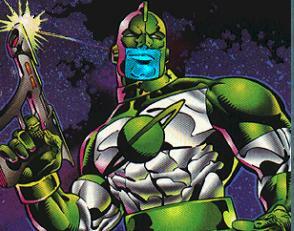 The original Kree had blue-colored skin, but a second racial group with pink skin resembling that of human Caucasians emerged over the millennia. At present, the blue-skinned "purebred" Kree are a small but powerful minority. Outwardly humanoid to a large degree, Kree bodies are adapted to environmental characteristics on Hala that are un-Earthlike: notably, higher gravity and a higher nitrogen content in the atmosphere. Although the Kree cannot breathe Earth's atmosphere without special apparatus, their denser bodies afford them about twice the average human being's strength and endurance. Despite their physical superiority and relatively advanced technology, the Kree race has reached the pinnacle of their evolutionary development, having not significantly changed in any way in tens of thousands of years. The Kree Empire extends across almost a thousand worlds in the northwestern lobe (Earth reference) of the Greater Magellanic Cloud. The Kree began their empire over a million years ago, within a hundred years of the acquisition of interstellar technology from the then-benevolent race of Skrulls. The Skrulls at the time were attempting to foster a galactic empire based on free trade, and they landed on Hala to help the barbaric natives advance to the point where they could join. Finding that Hala boasted two equally intelligent life forms, the humanoid Kree and the plant-like Cotati, the Skrulls proposed a test to determine the worthier race. The Skrulls took an equal number of Kree and Cotati to a distant planetoid in another galaxy, Earth's moon, and fashioning an artificial atmosphere in which to work, bid the two groups to use their resources to create something of worth of the barren world. The Skrulls then departed. The Kree set about constructing a magnificent industrial city. The Cotati produced saplings and grew an equally magnificent garden. A year later (Earth reckoning), the Skrulls returned and judged the Cotati's achievement worthier. Enraged, the Kree leader Morag incited his fellows to slay the Skrulls and the Cotati and seize the Skrullian starship and its attendant technology. Mastering it within two generations, the Kree launched an attack on the Skrull Empire, and led the once-peaceful Skrulls to become increasingly militaristic to repulse them. Thus the Kree-Skrull War began; a conflict that would last thousands of years. Though Hala is the planet of the Kree's origin, the planet Kree-Lar in the Turunal system is the capital of the Kree Empire as well as the seat of the government. The Kree Empire is ruled as a militaristic dictatorship. The permanent ruler is the organic computer-construct called the Supremor (or Supreme Intelligence), an immense computer system to which the preserved brains of the greatest intellects of the Kree race have been linked. Aiding the Supreme Intelligence is a number of imperial administrators on Kree-Lar, appointed governors of each of the member worlds, and a vast standing space militia. The empire also employs powerful automatons called Sentries to keep member-worlds under surveillance. The senses of the Kree are completely within the human range and for all intents and purposes are normal. The Kree can speak Basic and will most likely do so while communicating to races other than their own. The Kree are a highly regimented, militaristic society. Little else is known about their culture. The official state religion worships the Supreme Intelligence, although the government has permitted adherents to the Universal Church of Truth to erect temples throughout the empire, including on Kree-Lar. There are also secret sects of Cotati worshippers. The Kree Empire's technology remains hundreds of years ahead of Earth's, but has not had any significant advances in millennia. The Kree Empire, like the Kree race itself, is old and moribund. The Supreme Intelligence's rule has been conservative and relatively unimaginative. It remains to be seen how long it will take before the empire begins to crumble.